Breakfast is the most important meal of the day. Be sure to start your day with food for your soul as well as your body! Breakfast Bites is a devotional that will encourage you to study the Scriptures each morning. Your heart will be filled with the fruit of the Spirit and your eyes focused on God as you begin your day. Enjoy devotions that are meaningful and practical, helping you discover how to serve God with all your might and encourage others throughout the day. God's love for you is unconditional! Embrace it each morning and let it change your outlook for the day. 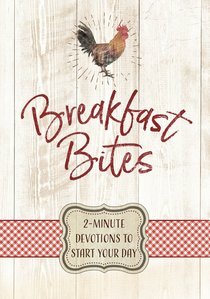 About "Breakfast Bites: 2-Minute Devotions to Start Your Day"